DuraMax is a division of U.S. Polymers Inc. located in southern California. DuraMax brand offers both maintenance free vinyl and steel storage shed options. 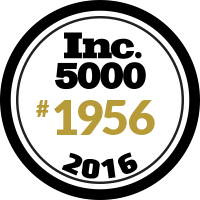 They produce building products that are made in the USA with the highest quality standards. All DuraMax sheds are eco-friendly and 100% recyclable. We ship all our DuraMax buildings factory direct! The DuraMax sheds storage track is designed to fit between any 2 support columns in your new DuraMax shed at any height you choose. On Sale Now! This Ground Anchor Kit for Duramax Sheds is a great addition for DuraMax shed owners who want to add a little strength and stability to their existing DuraMax shed. 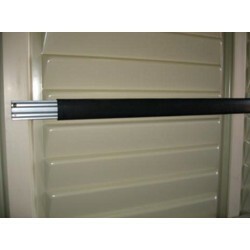 The four screw-type anchors help give your shed the security of being able to handle some windier situations that might otherwise cause the shed to shift position. On Sale Now! 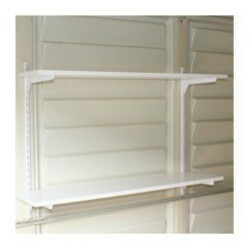 The 12" deep x 34" wide Single Shelf kit includes 2 uprights, installation hardware, 1 shelf and 2 shelf brackets. 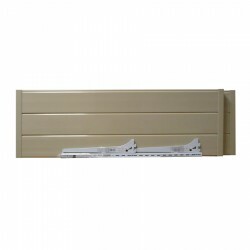 The 12" deep x 36" wide Shelf kit is all inclusive with 2 uprights, installation hardware, 2 shelves, and 4 shelf brackets. On Sale Now! Use this window kit 08211 for DuraMax shed models Woodbridge and Vinyl Garage. Not compatible with other models or brands. On Sale Now! The 12" deep x 50" wide Shelf kit is all inclusive with 2 uprights, installation hardware, 2 shelves, and 4 shelf brackets. This firewood shed will help you organize your firewood and keep them in order. 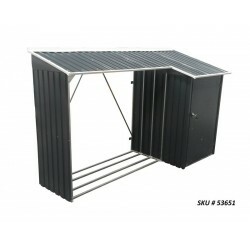 Made of heavy duty hot-galvanized steel framing to make sure that it can protect your woods. It comes with an extra room for your garden tools too. For more information, contact us at 877-307-4337. FREE Fast Shipping! 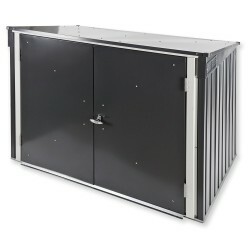 The Trash store is an all metal trash can enclosure, providing secure outdoor storage of up to 2 trash cans. It is made from metal, this storage unit offers excellent trash can or other items and is an ideal secure storage cabinet and general equipment.On Sale Now!FREE Fast Shipping! 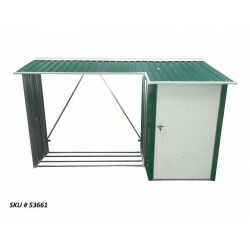 New from DuraMax, introducing our 8x4 Pent Roof metal shed kit! It is spacious enough to store most garden tools, and has large double-entry doors for the bigger items. Dent resistant steel and vents come standard. Optional floor kit. ***FLASH SALE***Only While Supplies Last!FREE Fast Shipping! Does your existing storage shed need a little more space? 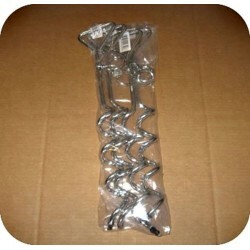 The duramax extension kit for Duramax Vinyl Garage is a great solution for you. 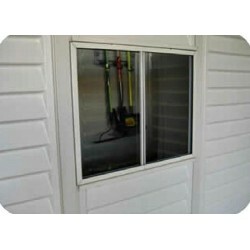 Shed extension is made of same fireproof, rust-free, rot-free, dent-free vinyl as shed. Vinyl Garage Extension Kit 10' x 2.5' to be added to an existing Vinly Garage Kit. On Sale Now! 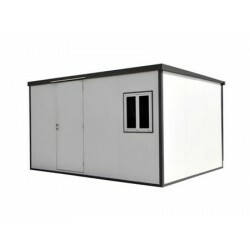 New from DuraMax, introducing our 8x6 Pent Room metal shed kit! The 8 foot wide format is great for most small and large outdoor uses. This shed is stronger than most metal sheds with dent resistant walls.FREE Fast Shipping! One of the largest and best-looking metal storage sheds on the market, our 10 x 8' provides 400 cubic feet of storage space. 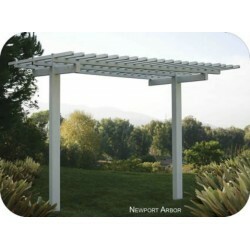 It's contempory design will beautify any backyard. The shed is large enough to store bikes, mowers, supplies, garden equipment.Liquidation Sale Until We Sell Out! 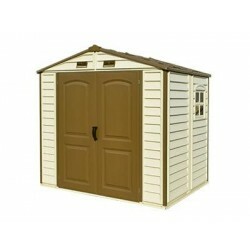 Looking for a small, maintenance free shed? Our DuraMax 4x6 StorePro Vinyl Shed is your solution! 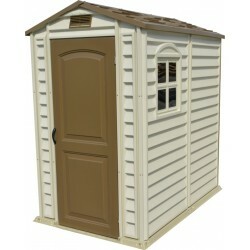 This small vinyl shed has a great look to it with accented simulated wood grain brown door and wood look-a-like shingle roof. FREE Fast Shipping! 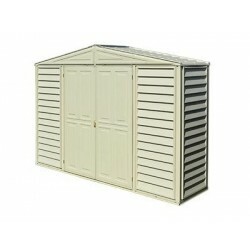 If you're looking for more storage space for your belongings, this is the shed that you are looking for! It is made out of durable material that will not rust, rot or dent. Comes with a foundation kit too! For more details, contact us at: 877-307-4337. FREE Fast Shipping! The 4x8 Sidemate is designed to lean up against the side of your home. The generous 8' depth gives you a large 154 cubic feet of storage space in a narrow side corridor of your home. This shed will give you the storage space for your belongings. FREE Fast Shipping! 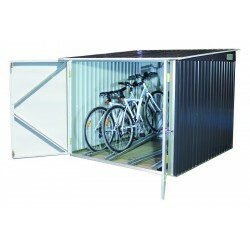 The bike store is an all metal bicycle shed, providing secure outdoor storage of up to 4 adult bicycles and cycling equipment.FREE Fast Shipping! Looking clean out your garage and get organized? 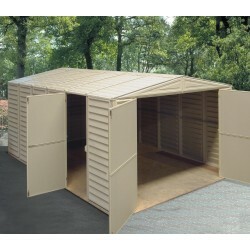 The Duramate 8x5 shed from Duramax will help you organize your belongings and store them in one area. 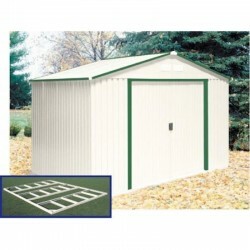 This shed is made with a steel frame and vinyl panels to be durable, so they last longer.On Sale Now! FREE Shipping!FREE 2 VENTS INCLUDED! Looking for an extra room to store your belongings that you don't need to be in the house? This shed can definitely help with that. 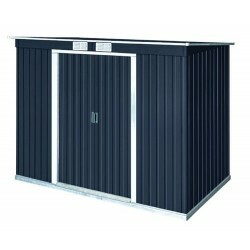 Made from durable material that will make your shed maintenance free making it last for a long term value. For more details, contact us now at 877-307-4337. ***On Sale Now***Only While Supplies Last!FREE Fast Shipping! Do you have lots of clusters in your house that you don't even use anymore? 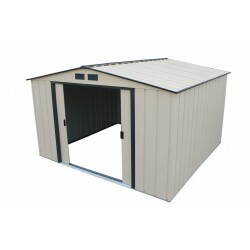 This StoreAll shed from Duramax, will help you organize them to keep them in place. 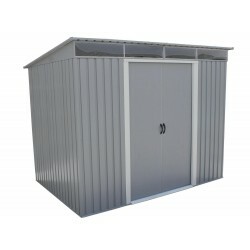 Made from strong metal structure to protect the shed from rusting and rotting. For more details, contact us now at 877-307-4337. FREE Fast Shipping!Promo FREE Item! Having a shed in your property gives us an extra room to help us with our everyday life. This shed can be turned into a garden, playhouse, office and she shed. 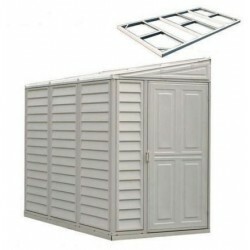 Made from heavy metal material, this shed will not rust, rot or mildew, making it more maintenance free. For more details, contact us at 877-307-4337. On Sale Now!FREE Fast Shipping!FREE Promo Item!